Discover the Europe onboard one of the world’s most revolutionary ships. Within the Mediterranean, cruise from Southampton, Barcelona or Rome to explore Spain, Italy, France and Portugal. If it’s a Northern Europe escape you’re after Celebrity Apex has a small number of cruises departing Southampton for Norway. As the weather cools down in Europe, Celebrity Apex makes her way across the Atlantic to Fort Lauderdale, ready to begin a season of Caribbean cruising. 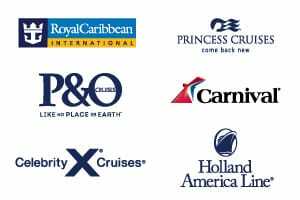 These Caribbean cruises are all 7 nights duration, with the option of visiting Mexico, Key West and Grand Cayman in the west, or Puerto Rico, St Thomas and St Kitts in the east. Can pick between the two? Why not book a back-to-back itinerary for a 14 night Caribbean immersion! 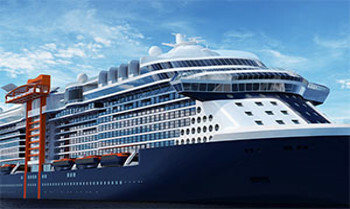 View all Celebrity Apex cruises, view a selection of Celebrity cruise deals, or view more options for Celebrity cruises. Celebrity Apex is the second ship in Celebrity’s highly anticipated Edge series. With an innovative outward-facing design and visionary spaces that stand apart from anything else at sea (with the exception of her equally stunning sister, Celebrity Edge, of course), Celebrity Apex will revolutionise the way you experience the world. Discover the unparalleled luxury of The Retreat, exclusively for all suite guests. Unwind in transformational accommodations that blur the boundaries between indoor and outdoor living. Soar above the sea on the Magic Carpet. Surrender to the carefree pleasures of the Rooftop Garden. And embark on a culinary journey through an unrivaled collection of restaurants, bars, and lounges. Celebrity Apex will sail the sparkling Mediterranean from Southampton, and then sun-soaked Caribbean from Ft. Lauderdale. For modern adventurers, travel isn’t a spectator sport. It’s about being fully immersed in new destinations and cultures without sacrificing comfort and style. Celebrity Cruises knows this. 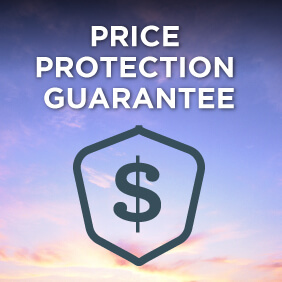 After all, we set the standard for modern luxury travel. And now we’ve made the destination experience even more immersive, starting right on board. From its unique outward-facing design to the industry-first Magic Carpet that reaches heights of 13 stories above sea level, Celebrity Apex breaks from traditional ship design. Here, predictability and convention are stripped away, returning luxury sea travel to its very essence: simple, beautiful, imaginative encounters that leave you relaxed, refreshed, and inspired by the world around you. Explore the sights, sounds, feel, scents and tastes of all that The Celebrity Shops have to offer. The Celebrity Shops are home to the finest selection of luxury items and tailored guest experiences. From dazzling jewellery to watches, beauty to spirits, The Celebrity Shops feature a lineup of world-class brands—many of which are available at sea for the first time—limited edition products, and unique discovery events that tantalise all five senses. A sensory-driven shopping journey, The Celebrity Shops are where you’ll find bold new styles for men and women. Immerse yourself in the design of your own one-of-a-kind jewellery piece, discover the character and flavors of an ever-evolving collection of spirits, and uncover looks inspired by the innovative Celebrity Apex itself. With a curated blend of luxury iconic brands like Bulgari, Cartier, and Tiffany alongside trendsetting new names, The Celebrity Shops offer guests aboard The Celebrity Apex a shopping experience unlike any other. What If Your Favourite Italian Piazza Could Travel with You? Welcome to The Grand Plaza. Located at the heart of the ship, this stunning gathering place has an energy that draws everyone to it morning, noon, and night. When you first enter, the sheer size of it will amaze you. Three decks open up to create an airy space that you might find in a cosmopolitan city—it’s like nothing else at sea. Inspired by the piazzas of Italy and the invigorating energy of everyone coming together to savor a taste of the good life, the Grand Plaza is home to our incredible specialty restaurants, along with our popular Martini Bar, Café al Bacio, and the new Grand Plaza Café. Stunning touches like the three-story Chandelier and intricate hand-stitched screens boldly declare that this is the place to see and be seen. The Grand Plaza is a transformational place that offers a different experience every time you visit. From day to night, the lighting changes from warm and inviting to bright and dramatic. Ever-changing entertainment and fashionable kiosks make the atmosphere spontaneous and your surroundings chic. Discover the talented design team, Jouin Manku and how their design approach makes the Grand Plaza so unique. Celebrity Apex is changing the future of entertainment at sea—or anywhere else, for that matter. We’ve raised the bar on vacations to even greater heights with onboard entertainment that is just as revolutionary, just as technologically mind-blowing, and just as carefully crafted as Celebrity Apex itself. Experiential, imaginative performances stay with you long after your voyage has ended. Through exclusive brand partnerships with Black Skull Creative, and the whimsical team at Three In One Entertainment and Consulting, Celebrity Apex brings award-winning shows and world-famous productions to you. Between its avant-garde, dedicated entertainment spaces and the creative production teams we’ve partnered with, Celebrity Apex surrounds you with engaging, spontaneous, and unforgettable entertainment moments that transport you from the everyday, every moment of your vacation. An unexpected space that only Celebrity Apex could deliver. Expertly designed and fully contemporary, the Theater offers unparalleled entertainment in a dynamic setting at sea. Immersive acts meet innovative technology on an ever-changing stage that displays everything from whimsical productions to edgy experiences, blurring the lines between audience and performance. Gathering space by day and a place of wild discovery by night—Celebrity Apex’s transformative venue will have you coming back for more. Experience everything from gaming and live DJ performances in this dynamic, multi-purpose space. Watch from the bar. Jump into the action. From sunrise to sunset, unexpected and engaging moments await at The Club. Eden, like so many aspects of Celebrity Apex, represents another revolution in modern luxury travel. It’s a space where nature is so present, we call it “a room that lives.” It’s an experience so multi-faceted and innovative, you won’t find anything else like it as sea—or anywhere. And no two visits to Eden are ever the same. Next level fun for young seafaring travelers of all ages. Every sailing brings a brand new adventure full of interactive experiences and amazing learning opportunities. Celebrity’s first and only fully customizable Camp at Sea program offers a robust selection of 500 activities, including the largest Xbox One X experience at sea, and enriching daily programming at some of the most unique contemporary spaces aboard Celebrity Apex. Brilliant innovations give you open air access to the sea, whenever you wish. The latest technology lets you precisely adjust nearly every comfort feature in your stateroom, suite or villa. Reimagined spaces feature larger living areas, bigger bathrooms, and a king-size bed in 99% of our rooms—an industry first for premium cruise lines—plus Celebrity’s eXhale bedding featuring the Cashmere Mattress. With the widest range of staterooms in the Celebrity fleet, there’s a room on Celebrity Apex perfect for your vacation needs. From our new Single Staterooms—designed for modern travelers who love to explore the world on their own—to our perfectly indulgent Panoramic Ocean View Staterooms. For our new Edge Class accommodations, famed interior designer Kelly Hoppen took the lead on design. Her vision evokes the intimacy of an inviting, indulgent urban apartment that opens to the most beautiful scenery on earth. With Kelly’s tremendous style, every stateroom on Celebrity Apex is a spacious work of art that you’ll be glad to call your home away from home. World-class restaurants that open your world. We’ve designed Celebrity Apex to change the way you experience the world, and our culinary philosophy follows the same line of thinking. We’ve turned our focus to the destinations we visit, bringing the flavors of the world to you—right on board. 29 unique food and beverage experiences crafted by a Michelin-starred chef speak to all of your senses in distinctly different ways. You won’t find another dining experience like this at sea – or on land for that matter. Discover each of our restaurant and bar venues in more detail below, and satisfy your appetite for adventure by booking an exceptional cruise onboard Celebrity Spex. Our goal to open your world through the culinary experiences we provide comes to life on Celebrity Spex. We rethought everything when we designed Edge—including our main dining experience. Choose from not one, but four complimentary, main restaurants, each with a distinctive design and ambience inspired by a specific region of the world. We wanted to expand our global culinary expertise even further on Celebrity Spex. To open the world—and palates—of our savvy travelers even more, we designed exciting new specialty restaurants found nowhere else at sea. Take your onboard dining experience to new heights at our seven specialty dining venues and see how we’ve elevated specialty dining to a true art form. We’ve expanded the dining opportunities in main dining with four new restaurants, and we’ve extended the complimentary dining selection across Celebrity Spex, as well. From the new Eden Café to the popular Oceanview Café and Mast Grill, there’s every opportunity to please your palate morning, noon, and night. There’s so much to say about the new dining experiences aboard Celebrity Apex, but we haven’t forgotten some of the tried-and-true popular bars and lounges onboard Celebrity Apex. Sample one of the largest wine collections at sea, or refresh and refuel with hand-crafted cocktails, ice cold craft brews or healthy snacks.